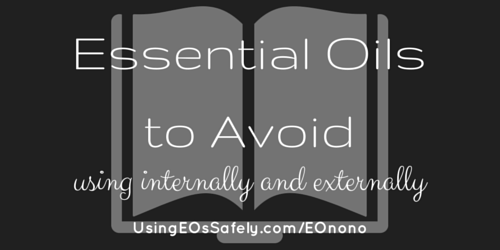 Most essential oils can be used, even if there are strong safety concerns, as long are they are diluted properly (see: Essential Oils and Cancer – potentially carcinogenic, and anti-carcinogenic essential oils). 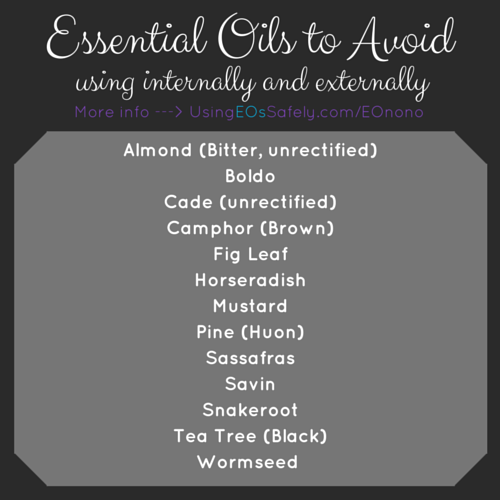 But there are some essential oils that are simply best avoided due to their toxicity. *Tea Tree (Black) “Melaleuca bracteata” is not the same as the commonly used Tea Tree “Melaleuca alternifolia” which is safely used. If you are unsure which you have, check the Latin name. **Camphor (Brown), Camphor (White), and Camphor (Yellow) all have the same Latin name of “Cinnamomum camphora.” So how do you tell the difference? If you have a GC/MS report available, check the constituents. Camphor (Brown) contains up to 60% safrole; Camphor (White) contains 40% or more limonene; Camphor (Yellow) contains 20% safrole.